mad orange fools: All better now. Ouch! He was a very good patient though and healed quickly. I took him to the vet after lunch to have one suture removed. (No charge for the removal, thank goodness.) 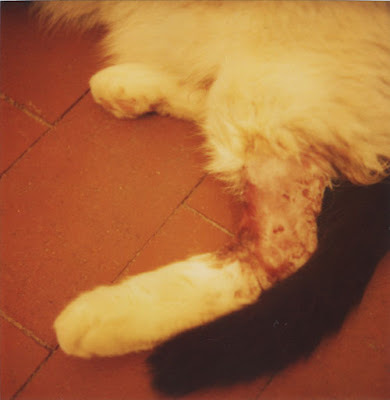 So he's all better now, back to roaming around outside, but hopefully staying away from the cat that did this to him. We started letting him go out again last week and noticed that he is sticking closer to home. Let's cross our fingers for no more trips to the vet until it's time for his annual check-up!